WE DID IT! We launched our boat from the Island Packet Yachts Factory Refit program on November 4, 2013. We trucked it back to Snead Island Boat Works where we rebuilt all systems and re-installed the canvas, solar panels, mast, new rigging and all reworked wiring. On December 30, we sailed south from near Tampa Bay on the west coast, heading for Biscayne Bay on the east coast of Florida. We based in Biscayne Bay for two months and learned the beauty and diversity of the Bay from South Beach to Boca Chita to Coconut Grove to Key Biscayne. We sailed and enjoyed great anchorages and beautiful sunsets. On March 5th, we set sail for the Bahamas along with two new buddy boats, IP32 Morning Grace with Dixie and Julie and IP38 Moondance with Bob and Nina. Together we all three explored the Exumas south to Black Point, focusing on the Exumas Land and Sea Park. Moving north we sailed to Eleuthera and on to Abaco where we enjoyed relaxing for the month of April. In May, we blasted for home, running offshore legs from Ft. Pierce, FL to Charleston, SC and then onto the Outer Banks of North Carolina. From there we traveled the ICW north to the Chesapeake Bay to our home dock in Rock Hall, MD. We traveled 2,100+ nautical miles in five months. We had a slip in Bimini for 3 days and a dock in Charleston for 4 days, otherwise we lived on anchor or an occasional mooring ball and loved it. It was another wonderful season cruising and reviewing the Bahamas and learning Biscayne Bay. We will now take a one month break, to work on the boat and visit family and friends. Our next voyage will begin on June 26th when we depart Rock Hall for New England. Thank you for sailing along, it was a great trip! Here are some HOME Photos…. Sara and Ken invited us for a BBQ Steak dinner! Of course we went out for breakfast! This map allows you to zoom in and see the beautiful islands, beaches and locations where we sailed. Spotwalla.com picks up where the SPOT company dropped the ball by not allowing users to easily save their pins. Blasting up the Chesapeake Bay in 22 hours…. We decided to make an overnight run from Portsmouth, Virginia, to Annapolis, Maryland, due to an approaching front and torrential rains. We also decided to make this run because a full moon was rising 3 minutes after sunset and the winds were to be 10-15 knots for a lovely broad reach. So, we departed the South Ferry Basin at 0800 hours, only to find ourselves in pea soup thick fog. There was so much fog that we almost could not find our way out of the Elizabeth River and into the Chesapeake Bay. By the time we reached Hampton and Point Comfort, we were considering diverting and dropping a hook to wait for the fog to lift. But after studying the weather we saw this fog would lift and be clear by mid morning. WRONG….WRONG…WRONG! This fog was with us for the next 22 hours. At times, we could not see more than 1/4 mile. We have sailed in Maine for three summers, so we have run in fog before, but we have never run in fog like this on the Chesapeake Bay! We said good-bye to IP38 Moondance, who headed to Deltaville, and we pressed on with IP40 Tintean. At night we had nearly zero visibility with zero horizon and no full moon could be found. We thought the full moon might light up the fog, but even when 1/4 mile off Cove Point Light house, we could NOT see the beaming light, so we knew the fog was still thick and dense. We pressed on at full speed, 6-7 knots and navigated our way north. 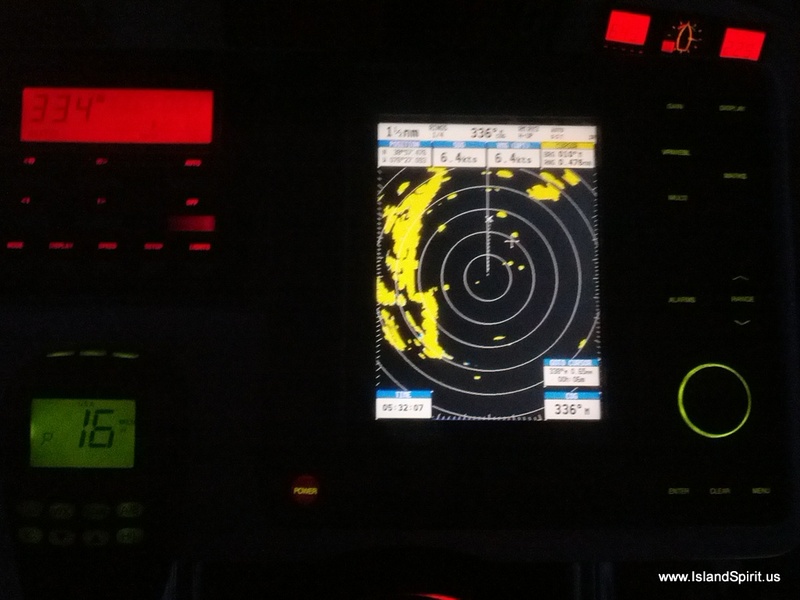 Our radar and our AIS (Automated Identification System) alerted us to ships and their paths. We stayed out of the shipping lanes and in the 30-40 foot deep water where ships cannot run. All we could was watch the radar at a 3 to 6 mile screen and look for anything solid on our course. We looked for bell buoys, day marks, fishing boats and 1,000′ long container ships doing 20 knots. We convinced ourselves that we were safe and that we would not hit anything and we kept moving. It was very stressful, especially for 22 hours with little sleep. At the end of this leg, we navigated ourselves into the Annapolis harbor with almost zero visibility. We could not see the Navy Fields or stone walls. We could barely see the first row of mooring balls, so we simply stayed along the port side and hugged the docks as we crawled toward the Spa Creek Bridge. We passed under the bridge at 0600 hours and secured our favorite mooring ball #50 and crashed for a few hours! Later that day, we met good friends Ken and Sara of IP-40 Tintean, with whom we had traveled overnight from Virginia. They invited us to the Eastport Yacht Club for cocktails and snacks with friends. Then we moved on to Backyard Boats where we enjoyed happy hour snacks, more drinks and some dancing. It is great to be back in these waters and Annapolis. Thank you, Sara and Ken, for a great evening of celebrating our safe arrival! One more leg and we will call this trip a wrap. Saturday morning we will sail the final leg to Rock Hall, MD where we will see friends and dock at our home marina, Spring Cove Marina. It is great to travel, but it is also wonderful to be in our home waters once again! How to lift a Navy Ship and paint the bottom! with 8-15 crew members, anchored year round off the coast! Portsmouth South Ferry Basin with our sun shades up. Radeen and Sara enjoying the Eastport Yacht Club. Thank you, Ken and Sara! One last leg home to Rock Hall, MD and this Bahamas Year #3 will be completed. What a great year it has been. Thank you for sailing along. IP38 Moondance rounds a tree lined bend…. Note to All: The Dismal Swamp is not dismal, matter of fact, we find it interesting, beautiful, peaceful and photogenic! After locking up 8-9 feet at the South Mills Lock, you run the 22 miles of the swamp canal where you enter the Deep Creek Lock and drop back down 8-9 feet. Exiting the Dismal Swamp northbound you are then presented with the massive commercial activity and Navy Ship Yards of Portsmouth and Norfolk, Virginia. We find this contrast most interesting, challenging and exciting. 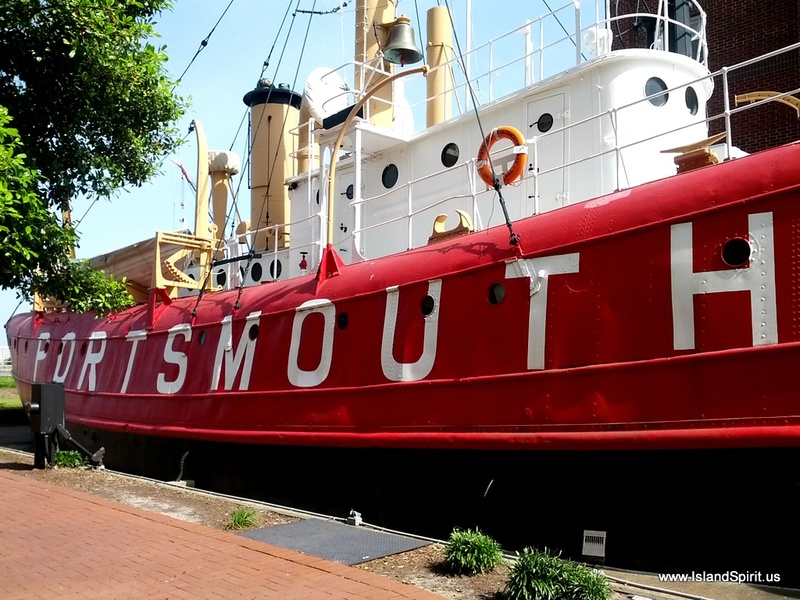 That is why we always stay a few days in Portsmouth, VA and enjoy the waterfront town, the Commodore Theater, and the peaceful historic streets and homes. Welcome home, you are almost back to the Chesapeake Bay! Our next leg will take us home into the wonderful Chesapeake Bay where we have sailed since 1984. This is when and where we feel at home, these are the waters we know, this is comfortable. We have traveled 1,917 nautical miles since December 30, 2013 from Tampa Bay via the Bahamas to the Chesapeake. We are glad to be here! This is our 5th passage through the waters of the Neuse River, Pamlico River, Alligator River and Pungo River and we never seem to get tired of taking in the diverse scenery and wild nature of this beautiful waterway. This trip was unusual in the fact that we could sail the entire area and some boats even ran a full jib, on a beam reach, while running the 22 nm Alligator River-Pungo River canal. From beautiful sunsets on anchor in the Alligator River to beam reaching across Albemarle Sound in 1-2 foot chop to a custom ultra light sea plane doing fly-bys and Marine Corps jets making practice flights, this leg is always so interesting. Along the canal we spotted many turtles and a few birds and one deer along the water’s edge. When heading north, this leg ends in the CITY OF HOSPITALITY, Elizabeth City, NC where the famous ROSE BUDDIES host a free wine and cheese party for the visiting boaters. Former Mayor Steve Atkins and Charlotte Underwood, Director of the Convention and Visitors Bureau were our gracious hosts. There is no other town on the entire waterway that makes cruising boaters feel more welcome and more at home than Elizabeth City, North Carolina. Imagine giving away free docks and free water and free wine and free WiFi and free snacks just because we stopped in and visited. NO OTHER CITY does this! It is always a joy to spend time here and to support the local town by shopping, dining and spending money here. We will spend two days doing just that with our buddy boat friends Nina and Bob on IP38 Moondance. (Good-bye to new friends Dave and Suzy of IP37 Cay Paraiso who took the Virginia Cut route to Norfolk on their way home to Maine.) Welcome to Elizabeth City, NC! Sunset over the Alligator River after our first 90 degree day this year! We got buzzed by a custom ultra light sea plane, how cool! The pilot waved at us! From Beautfort, NC we sailed north up the Neuse River to Bonner Bay where we anchored out. This map begins at Bonner Bay where we crossed Bay River and then motorsailed through the Alligator Pungo Canal and anchored in the Alligator River. From there, we sailed north on a nice west wind of 15-20 across Albemarle Sound and up the Pasquotank River to Elizabeth City. We have had 3 days of great sailing – so much fun! Suzy, Radeen and Nina on Island Spirit…. I love when a plan works out as planned. We identified our Bahamas exit while at the Jib Room on anchor in Marsh Harbor. We planned 4 legs. #1 Green Turtle to Fort Pierce, Florida. #2 Fort Pierce to Charleston, SC. Then #3 Charleston to Beaufort NC. Then #4 into the ICW and north to the Chesapeake Bay. Well….that is exactly what we did, just as planned. Lucky for us, we had the weather windows to make the legs, and we also studied the legs and the weather to make sure we were making the best runs at the best times. Sure enough, we did, and we feel very lucky. We are now on the ICW north of Beaufort anchored out on Bonner Bay. Tomorrow we will run 50+ miles into the Pungo Canal and on north. If all goes as planned, we will be in Portsmouth VA in a week, then onto the Chesapeake Bay and home to Rock Hall, MD completing year #3 of our Bahamas explorations. We are having fun running with our boat buddy IP38 MOONDANCE, Bob and Nina who are very positive and lively friends. We also are now running with IP37 CAY PARAISIO, Dave and Suzy who are just as fun and lively so we have a fleet of IPs running north. What a great life out here cruising and exploring. Everyone is experiencing the same challenges and new discoveries of travel. It is a great way to travel, explore and live. We count our blessing of good health and a positive attitude every day. Here are some photos of the days from Florida to North Caroline…. You drive towards the lower light. When they line up vertically, you are in the channel. Remember…..You can follow our passages and our trip using this near realtime SPOT map. When we are out of Internet connection, or when we are moving the boat, we place a pin location onto this map. To see our trip, drop down the HISTORY button and select as many days or weeks or ALL and then click GO. Then zoom the map out to see the trip.